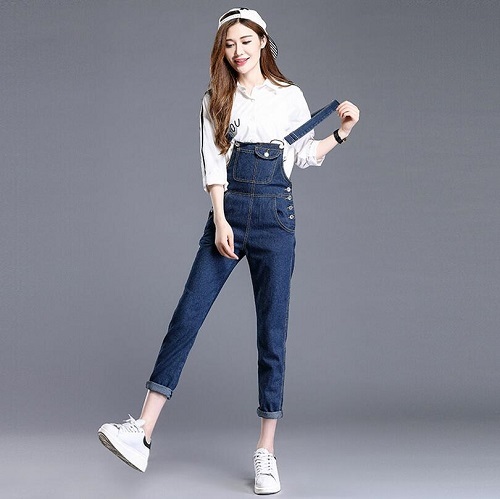 One of the most convenient and fashionable outfits for casual life is jeans jumpsuits. It has an old history when women after the Word War 2nd started to work in farms and factories doing manly jobs, they had to wear cozy special outfits that make them comfier to work. 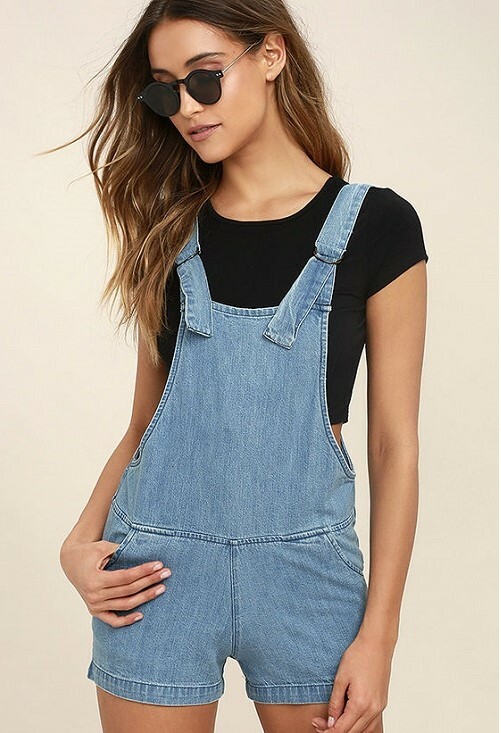 Today few people know the history of this dressing idea but the fact is that jeans jumpsuits are big outfit trends and everyone loves them to wear in everyday life. Let’s see how to wear jeans jumpsuits in order to look more stylish. 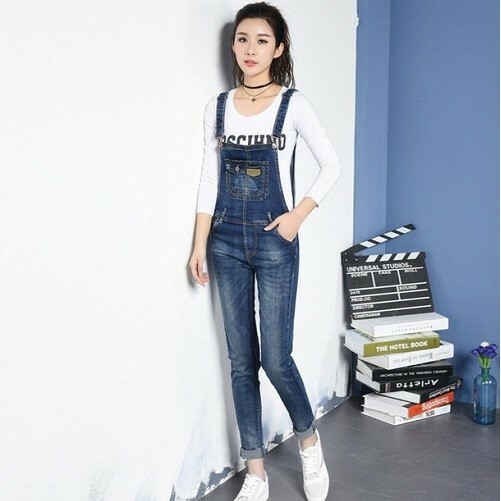 White T-shirts and sporty tops are the first choice you may make when wearing denim jumpsuit. Choose a high-waist dark denim jumpsuit with shorter ends (or cuffed style) and match it with your favorite T-shirt. In the majority of cases stylish girls go for white T-shirts to create a well-balanced and classic style. This is the most popular way of rocking jeans or denim jumpsuits. As for accessories, try to keep them in casual and sporty style by wearing small studs, chokers, leather bracelets and so on. Finish the look with sneakers or sandals. Do you like grabbing attention even on casual days? You probably often wear high heels. Well, let’s see if it’s appropriate to wear high heels with denim jumpsuit. While some designers and stylists offer rocking denim jumpsuits with bright-colored high heels and accessories, others advise elegant and classic shoes. Whatever your choice you can always create a new and impressive look with trendy high heels. Even the brightest red shoes can look fantastic with dark denim jumpsuits if they are up-to-date. Opt for long straight or ponytail hairstyles for the best result. Special for your lovely beach looks there is the combination of overall shorts with crop tops. This bold style is not for everyone. It’s only for those who seek for more attention and are open to criticism. However, this look is becoming more and more popular on the beach. 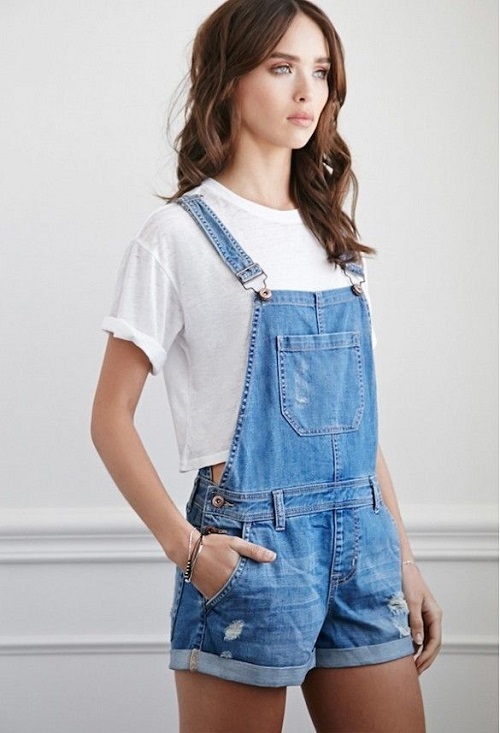 You may match your simple overall shorts with any crop top you like. White and black crop tops are the most loved ideas but you can are welcome to go for brighter hues and bolder matchings. Keep your hair loose and wavy like a real beach girl. There is something very girlish in such a cozy look. You show off more body and it makes you more eye-catching. Besides, crop tops are great for hot days. And here you see an extravagant solution for women wearing hijab. Let’s think out of the box and create a mixture of big trends. 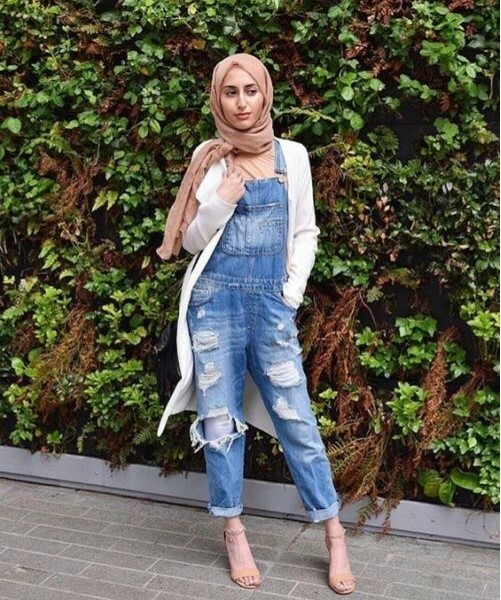 Rock a ripped denim jumpsuit with your favorite blouses and T-shirts and finish your look with hijab, sunglasses, sneakers or high heels. This crazy look will draw much attention than the rest of combos. It’s a modern solution for every open-minded woman living in East. You may even take a long elegant jacket with you for a complete elegance.